Oof. I missed Tuesday. Sorry posting has been so erratic; work has been crazy! Yep, I still have that pesky day job that pays for pesky things like the mortgage, so sadly it has to take priority. I think things are a little more under control (bahahaha famous last words) so I will be back to a 2-a-week schedule. Or not. We’ll just have to see what happens, won’t we? Because things have been bonkers, I’m really enjoying simple, FAST, snacky things lately. Oh, did I tell you I made Deviled Eggs for the first time? I’m not even sure if I made them “right” (do they have to have Dijon mustard in them, or does it still count if they don’t?) but they used up a bunch of sad, unloved hard boiled eggs in my fridge and tasted great so… let’s call it a draw. Anyway, I’ll share that recipes soon, but first, you have to try these normal-people blinis. What’s a blini? A delicate little pancake topped with crème fraîche, smoked salmon and caviar. Maybe one day we’ll make tiny pancakes, but today is not that day. 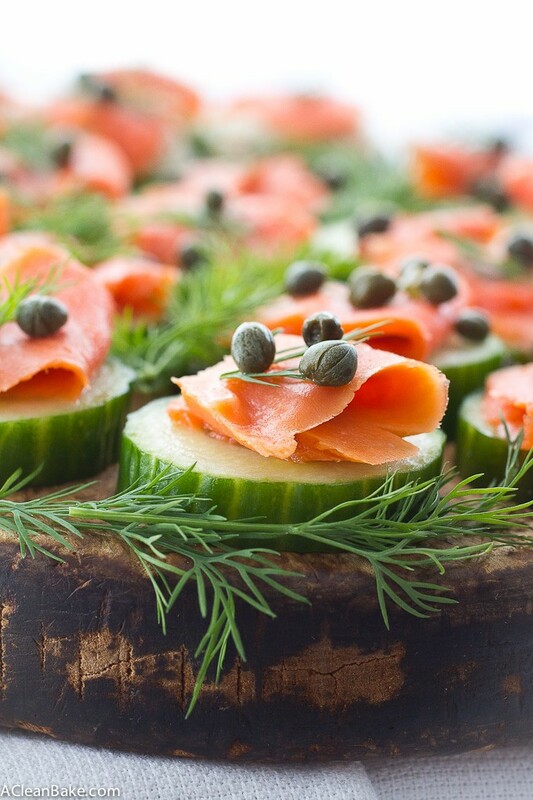 Today, we take every shortcut imaginable, replacing the blini with cucumber (so much faster), replacing the caviar with capers (so much more realistic, unless you’re a Russian oligarch) and skipping the crème fraîche all together (so much more allergy-friendly). Granted, smoked salmon is a bit of a splurge, but I get wild-caught (so much more nutritious and environmentally-friendly than farmed) at Costco and it lasts me forever. It’s really, really good, and not fishy or weird at all. It comes in a two-pack and I use about half a pack at a time, freezing the remaining salmon in an airtight zip top bag so that I don’t risk wasting any of it. Trust me, it’s a worthwhile investment. Wouldn’t you rather have this fancy pants snack than scooping peanut butter out of a jar (not that there’s anything wrong with that) today? 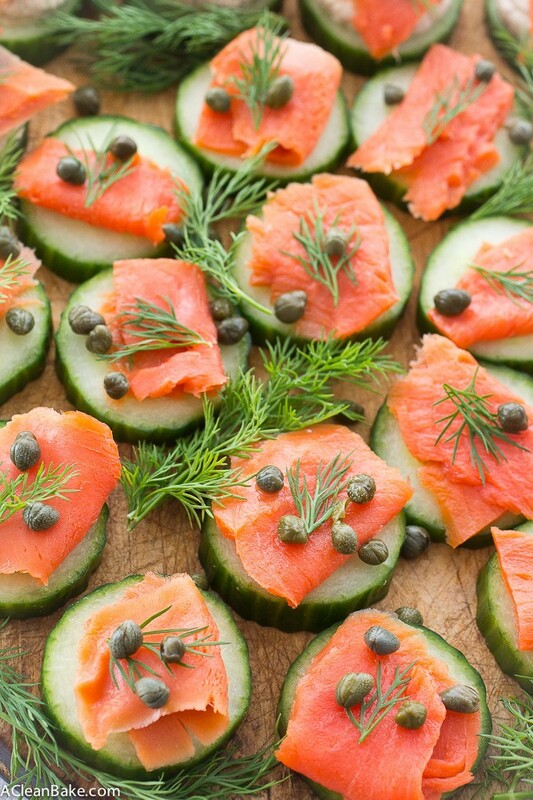 Lay all of the cucumber slices out on a platter or cutting board. 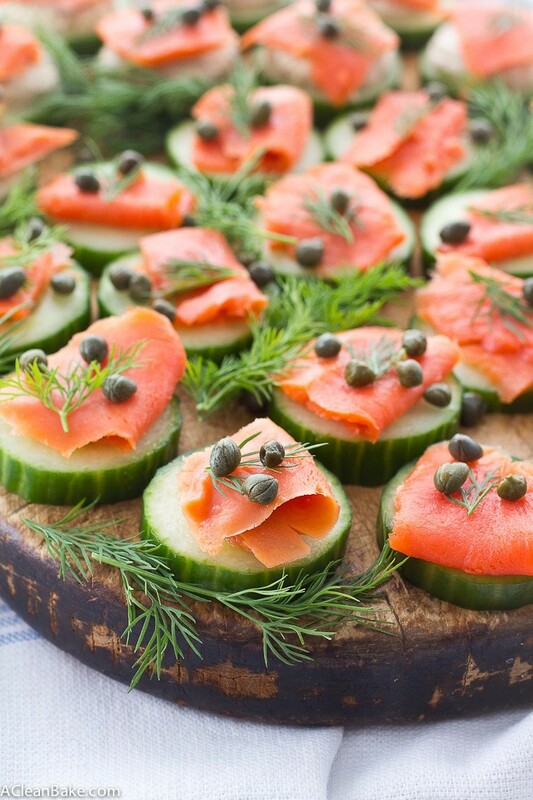 Top each slice with a small slice of smoked salmon, then a few capers. 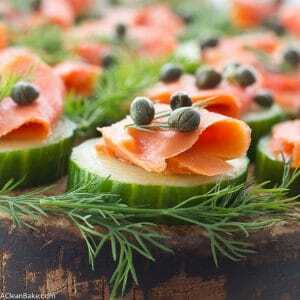 Immediately before serving, sprinkle the platter with a generous amount of roughly chopped fresh dill, fresh cracked black pepper, and a drizzle of fresh lemon juice. You can absolutely feel free to add a dollop of creme fraiche, plain (tart) Greek yogurt, sour cream, or even a dab of dijon mustard on top of the salmon for a little extra flavor, if you'd like. It will also help the capers stay put better. Leftovers will keep in an airtight container in the fridge for up to three days. Yield: approx 25-30 pieces, but it depends on how thickly you slice your cucumber. Hi Candice! You might be able to try this with another smoked fish, if you want! Nora, salmon is a favorite of mine. I love how you put a modern spin on a classic. The Copper Salmon just came from Alaska here in the PNW. Yeah!! Perfect timing! I hope you get to make these! What could we use besides capers? Something briney or salty. Maybe minced pickles? This looks so simple and yummy I am going to prepare for a small dinner party on Saturday night. Will the cucumber stay crunchy if I make on Friday and leave overnight in a sealed container? P.S. I love your recipes and will keep experimenting. Hope you had a great dinner party! Sorry for the delayed response, but I would not recommend making it more than 24 hours in advance. The cucumbers won’t be *as* crunchy as sliced fresh but they will still be crunchy.